According to a recent article from The Engineer , the advent of new digital design processes and tools such as virtual reality technologies are having a revolutionary impact on the manufacturing and engineering industries. Here we take a closer look at how such technologies are changing the face of engineering. The term virtual reality typically brings to mind images of large gaming headsets, popular in the 80&apos;s and 90&apos;s. Whilst to date this technology has been primarily used for video game purposes, the potential of virtual reality is thought to be huge. Indeed, virtual reality is not just for video games, and in factories across the world virtual reality is helping to manufacture reality by allowing companies to test designs and experience products before they are even made. Engineers are currently researching how such digital technologies could help streamline manufacturing processes by cutting the time it take to build products. For example, research groups are using technology inspired by video games and special effects such as motion capture to create a unique collaborative environment where problems can be solved quickly and manufacturing processes refined before production even begins. According to a recent article from The Telegraph the defence and aerospace company BAE Systems is currently employing virtual reality technologies to build Royal Navy warships more cheaply and efficiently. This 3D virtual reality technology is enabling engineers to walk through full size computer generated models of the ships they are working on, allowing them to explore every nook and cranny so that they can identify and eliminate potential issues before construction even begins. This 3D experience has the benefit of helping the team to discover any potential design problems before the ships are built. In this way, it’s hoped that the technology will be beneficial in cutting the cost of any remedial work. To date BAE has developed five so called visualisation suites, all of which are networked together allowing collaboration between people in different parts of the country. The automotive industry has also been embracing virtual reality technologies for a number of years to aid in the design of its production processes. Many high end companies in the automotive sector are also using virtual reality to give customers a glimpse of the layout and look of a vehicle. 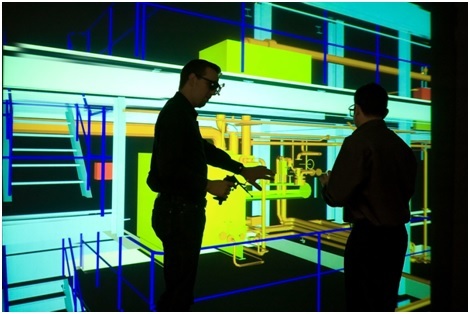 Advances in the use of virtual reality could open up significant opportunities for engineers within the manufacturing industry and it will be exciting to see what the future will hold for this revolutionary design technology. Here at European Springs we’re passionate about design and technology and are leading suppliers of a wide range of high quality spring products including disc springs. For more information about our range of products and services, please don’t hesitate to contact us today by giving us a call on 44 (0) 208 663 1800 and a member of our friendly team will be happy to help you with your enquiries.